A few months ago, Hamiltonians had the opportunity to give feedback on the council’s plans for the coming decade. Feedback in various forms was accepted, including “online and paper submissions, social media feedback (Facebook and Twitter) and through public, targeted and Maaori engagement sessions” (the hashtag #ham10yp was used on both Twitter and Facebook). A total of 649 written submissions were received during the submission period, all of which can be read in their entirety here. So, combining the above results with the transport-related topics from all other submissions, we get the following. So as can be seen, there was very strong support for provision for cycling and walking. 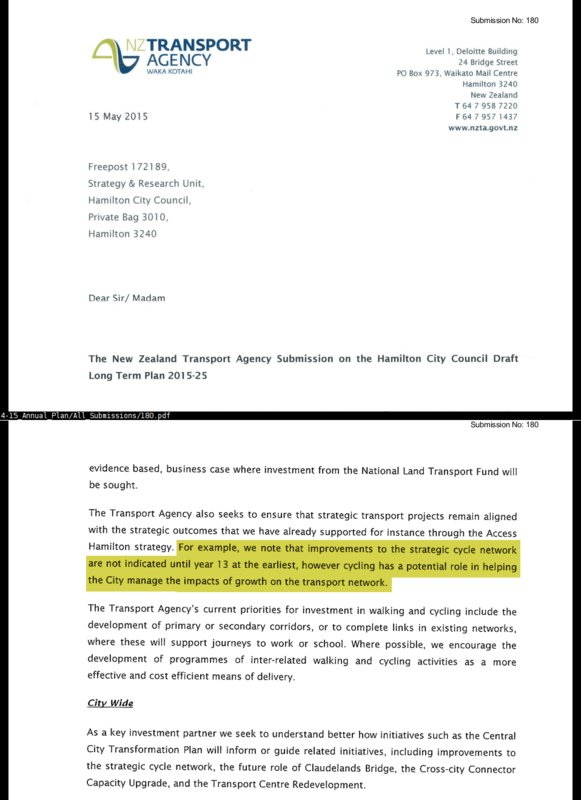 Notably, there was little in the way of support for public transport and even less for roading in general – of course, this may be due in part to the fact that roading is currently very well funded in Hamilton, consuming the vast bulk of the $50 million per year ($205 of every $1000 of rates money) transportation budget. And here’s some more of peoples’ thinking around transport. “More than 5% of the population already walk and cycle on a regular basis, so why are they not entitled to at least 5% of the transport funding, when they need it (i.e. now), rather than at some vague point in the future? “Q: Which projects would you like to see deferred to later and why? More support for maintenance of footpaths. Less spending on big roading projects or delay more. Make local roads around the city along with pedestrian crossing spots safer e.g. Victoria Bridge and Bridge St, Hamilton East. Why no new/extra bus shelters? As older persons age they gradually have to give up their cars and move to public transport. Delay building a Bridge north of city – and make the bridges Hamilton already has safer for pedestrians/cyclists. Put in a controlled crossing on Cobham Drive near a garden entrance for the safety of pedestrians and cyclists. 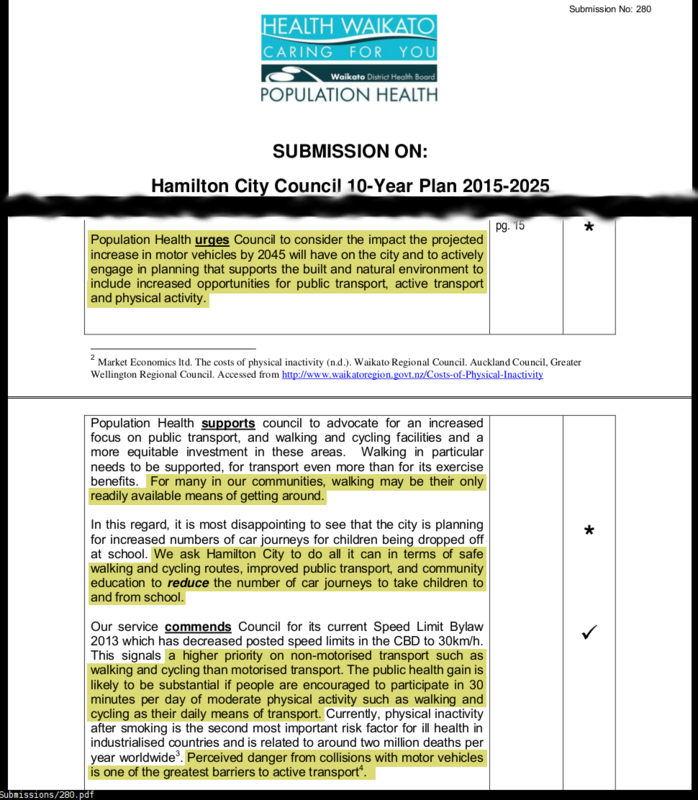 “In reviewing the Long Term Plan we would note the absence of any reference to the Active Hamilton Strategy and the Hamilton Bike Plan. We know that sport and recreation across our region is increasingly competing with ‘inactivity’ and that participation trends are changing to individual participant-centred pursuits. Activity increasingly occurs in the outdoors and with friends – traditional models for participation are changing and we need to ensure that in a partnered way we stay ahead of these trends. References report on Mean Hamilton House Prices 1970 Compared to 2014 prepared by Chris Simpson. * From 1960 to today Hamilton average house price have increased from $349 to $429 once adjusted for inflation. There are some nice images of what they would like to have as Hamilton East Precinct Development. I do think they could look to plan for more of a step change to this area.